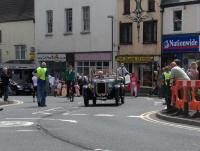 July 11th was the day of Dursley's Festival, this time being a day of two parts. From 9am to 2.30pm the Festival of Food took place under the Market House and attracted a large number of visitors to sample the numerous stalls which were selling their wares. The procession then wound its way through town, ending up on the recreation ground, where events were held in the arena and visitors could visit the many exhibitors and trade stands which surrounded it. In the centre of town, work has restarted in earnest on the new supermarket after a reassessment of the water courses which flow under the site off castle Street. All the earth has been removed from the steel-piled area next to the swimming pool, in preparation for extending the car park. Much of this has temporarily ended up on a huge heap on the site of the old fire station. At the other end of town, new house construction has also started on the ex-Lister Littlecombe site. On July 5th, the sculpture trail in Twinberrow woods was relaunched with the addition of several new sculptures which are now in position in this attractive part of Dursley's surrounding woodland. The Dursley Festival was opened this year by ex-Olympic ski-jumper "Eddie the Eagle Edwards". Led by the vintage car carrying the winner of the Gazette's "Rosebud" competition, the procession arrives from Silver Street. 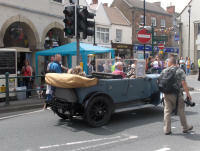 The lead vehicle in the procession heads past the Market House before making its way up Parsonage Street. The earth has all been removed from the area next to the swimming pool, leaving the new piling fully exposed. This section of the site will be used to extend the car park. 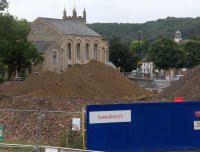 A huge mound of earth has appeared on the site of the old Fire Station and will no doubt be moved around the site again as work progresses on the new Sainsbury's supermarket. Dursley has a new restaurant on Long Street, this one trading from the premises once occupied by the Cook Shop which closed on June 7th 2008. This is one of the new pieces in the relaunched Sculpture Trail in Twinberrow Woods. Construction of new houses has now begun at the Littlecombe site. This is the view from the old Church Road, Cam entrance to the Lister site.